My previous dissection of the mechanism for ester hydrolysis dealt with the acyl-oxygen cleavage route (red bond). There is a much rarer alternative: alkyl-oxygen cleavage (green bond) which I now place under the microscope. The mechanism (in 4D) of the reaction between thionyl chloride and a carboxylic acid. If you have not previously visited, take a look at Nick Greeves’ ChemTube3D , an ever-expanding gallery of reactions and their mechanisms. The 3D is because all molecules are offered with X, Y and z coordinates. You also get arrow pushing‡ in 3D. Here, I argue that we should adopt Einstein, and go to the space-time continuum! By this, I mean one must also include the order in which things happen. To my knowledge, no compendium of (organic) reaction mechanisms incorporates this 4th dimension. My prelude to this post nicely illustrated this latter aspect. Here I continue with an exploration of the mechanism of forming an acyl chloride from a carboxylic acid using thionyl chloride. The mechanism shown at ChemTube3D is as below and will now be tested for its reasonableness using quantum mechanics. HCl reacting with a carbonyl compound (say formaldehyde) sounds pretty simple. But often the simpler a thing looks, the more subtle it is under the skin. And this little reaction is actually my prelude to the next post. 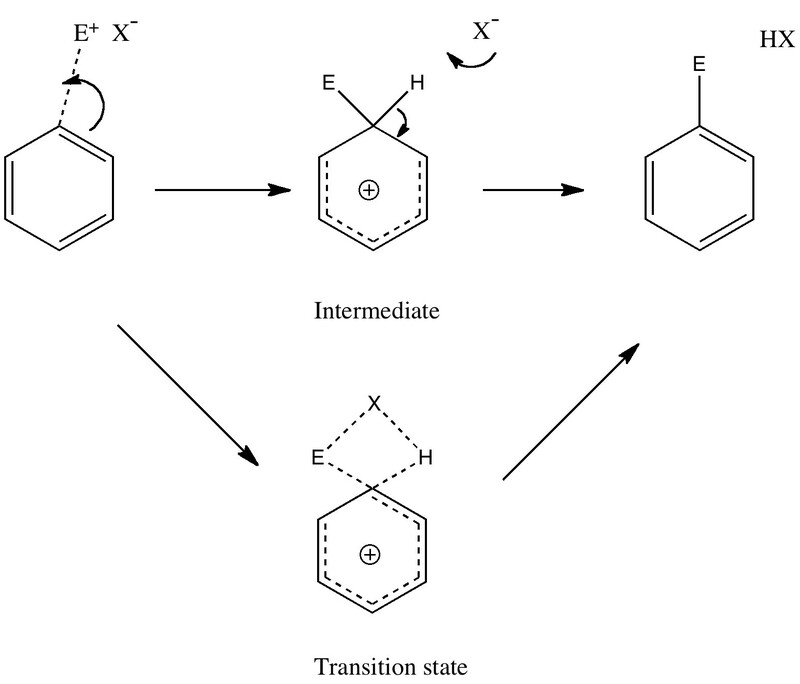 Unravelling reaction mechanisms is thought to be a 20th century phenomenon, coincident more or less with the development of electronic theories of chemistry. Hence electronic arrow pushing as a term. But here I argue that the true origin of this immensely powerful technique in chemistry goes back to the 19th century. In 1890, Henry Armstrong proposed what amounts to close to the modern mechanism for the process we now know as aromatic electrophilic substitution . Beyond doubt, he invented what is now known as the Wheland Intermediate (about 50 years before Wheland wrote about it, and hence I argue here it should really be called the Armstrong/Wheland intermediate). This is illustrated (in modern style) along the top row of the diagram. The oldest reaction mechanism: updated! is licensed by Henry Rzepa under a Creative Commons Attribution-Noncommercial-Share Alike 3.0 United States License.